An E&P company can invest millions in a well before it is even drilled through the critical step of running title. I am confident that the industry will benefit from our new title cost calculator by gaining a clearer view of the potential cost of running title. Tracts, a venture-backed Houston software startup, announces the availability of a new online tool to help oil & gas companies calculate the costs of running title, the complicated process of identifying mineral ownership preceding a lease. Given the rise of US drilling and leasing activity, exploration and production companies face increasing title costs with billions invested every year. Available on Tracts’ website, the new title cost calculator allows land professionals to define a title project then generate cost and time estimates for the multiple factors involved in running title, such as acreage, title attorney hourly rate, and number of courthouse documents that must be examined. Prior to leasing land for drilling and development, oil & gas companies must perform extensive due diligence to identify mineral and surface rights ownership, also known as running title. The process can create thousands of dollars in legal fees even for a small tract of land and can exceed $1M to analyze larger acreage. As a developer of title management software, Tracts simplifies and automates the process of running title. The company built its cost calculator to assist land professionals in estimating their title project costs using traditional methods that involve many manual steps, outdated tools, and redundancies. 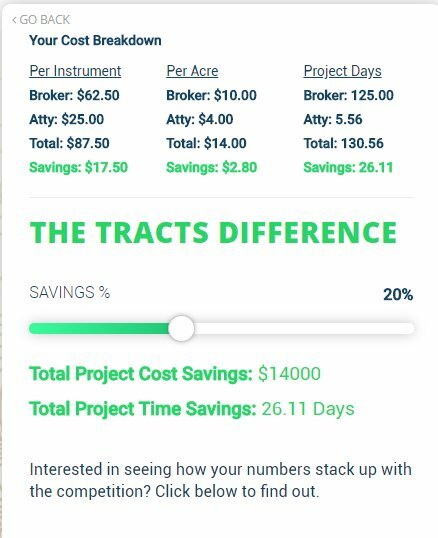 The Tracts title cost calculator allows users to input key data for a project they have already completed or planned title project, including oil & gas producing region, for example Permian Basin, number of acres, attorney hourly rate, and landman day rate. The calculator also takes into consideration the number of courthouse records, or instruments, that must be processed and the costs of creating runsheets and title opinions. A total estimate of cost and time required for the title project is then generated along with a breakdown of costs by instrument, acre, and day. “An E&P company can invest millions in a well before it is even drilled or a lease signed through the critical step of running title, a process that has historically been time-consuming and fraught with hidden costs,” said Ashley Gilmore, CEO and Co-founder at Tracts. “I am confident that the industry will benefit from our new title cost calculator by gaining a clearer view of the potential cost of running title as well as the cost-savings opportunity,” he added. Tracts’ title cost calculator is provided to the oil & gas community as a complimentary service to help energy companies, land departments, brokers, and landmen understand the complex investment of running title. To underscore the value that its title management software offers, the calculator provides an estimate of cost savings Tracts would provide on the specified title project. Users of the calculator also have the option to compare their title project costs and savings with historical project data from other land professionals. Tracts is a venture funded software startup focused on modernizing the way oil and gas land departments determine mineral ownership. The company uses a patent pending math engine and data visualization to simplify the highly complex, manual process of establishing legal ownership, which exploration and production companies require in order to acquire, or lease land, and drill. As a result, E&P companies reduce the time needed to establish title by up to and exceeding 50%, providing much needed cost and operational efficiencies in the United States energy market. Based in Houston, Texas, Tracts was founded in 2014 by legal professionals and computer scientists with extensive experience in the oil & gas title process. Visit http://www.Tracts.co for more information.